WordPress become increasingly more popular day by day because of its power and popularity. As you know WordPress is the best platform to make your own website within simple and easy steps, unlike traditional way to make the website. If you are searching best responsive WordPress themes, you need to spend some time on the internet, but it will handy to find the best theme as per your needs. Since there are a huge number of themes available in the market with a variety of feature, and free & premium versions. If you are looking best and responsive WordPress themes with massive features that make some extra cash and improve your business, you are the right place. We have done an analysis of responsive WordPress themes for your multipurpose business and to keep your audience in 2019. All the theme which we have added here are fully responsive and can be accessed from any kind of devices. Furthermore, unique and different styles that will apply for all kind of industries such as business, corporate, personal, portfolio and real state. Additionally, all the themes are developed with high-quality codes that can be easily edited and customize as per your requirements. Almost all themes include strange features that will specifically help you to find the best theme for your needs for sure. 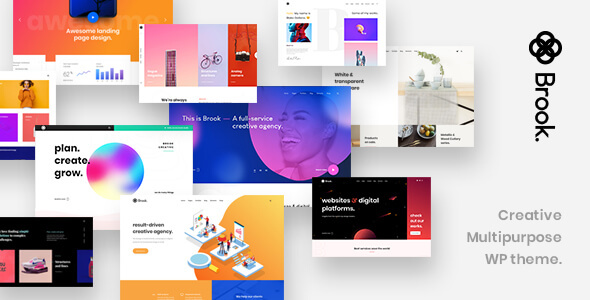 So here is the list of best responsive WordPress themes for 2019. 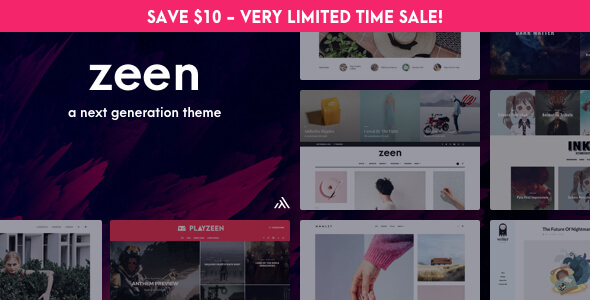 Zeen is the next generation magazine WordPress theme that you can have a better experiment, unlike other WordPress magazine themes. Nicely design theme that will apply to make your awesome WordPress website such as magazine website, blog, newspaper, review and WooCommerce shop page to manage your online business. Awesome and unique front-end theme option will make your website instant and real time. Multiple demos available to view the flexible of Zeen WordPress theme in order to make a decision before actual development starts. As well as Zeen providing a cool feature that you can import demo content to a website within one minute, there your website is ready to up and down. Its uses Ajax technology to view the changes even without refresh the page, pretty awesome. Additionally, its support for integrating the WooCommerce plugin to your website to create and manage your shop pages. Clean and neat codes that developer will be love to edit and customize it without any hassle. As well as another cool feature from Zeen is WPML support, which great plugin is to integrate multilingual feature, rank your website with SEO, fully support with popular SEO plugin Yoast. 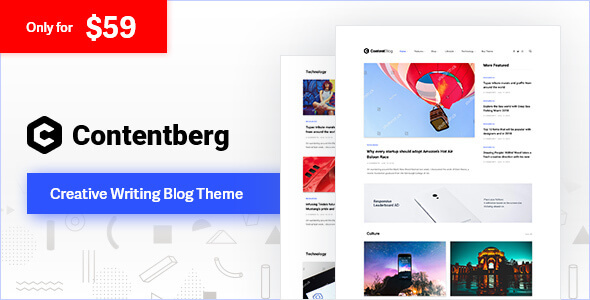 Contentberg is a premium WordPress theme with a variety of pre-built features that highly compatible with making the blog and content marketing website with minimal requirements. This theme also allows your audience to engage and keep visit your website with it awesome pre-defined features. For those who use this theme will get an automatic update that will notify in your dashboard area. Creatively created pages and layouts will make the website for higher rank in google search engine and allows to improve the business as well. It support for visual composer page builder that allows to make your own page design with drag and drop facilities. The number of layouts styles that you can select for your page, such as magazine layouts, list, grid, combination and simple blog layouts choose your preferred one. The great feature of this theme is support for AMP to speed up your website and rank in google. Choose your article style as your wish, there six different types of the article such as centered, full width, classic sidebar, overlay and more. Start selling your product and showcase your creative invention by integrating the WooCommerce plugin that allows to make and manage your online store. The leedo comes with the bundle of features and drag and drop unlimited page maker design with WPBakery page builder. Its fully responsive theme with the modern design that will be really applicable for all kind of devices, as we tested its looks perfectly on various display and resolution from regular desktop screen to tablet and mobiles. Like other responsive theme, this also has an opportunity to import demo content to your website that will run under one minute. Additionally, 12 different types of home page demo available that will look massive from the users’ perspective. Meanwhile, you can edit and customize that homepage with visual portfolio editor as per your requirements, likewise, its generating short-codes to make the development more speed and live. Leedo powered 7 different types of blog, that allows checking your blog styles unique and suitable that match with your website. Furthermore, its support for ACF professional which allows to include extra fields and features to improve the website development. Likewise, there is a huge number of features available for buyers. 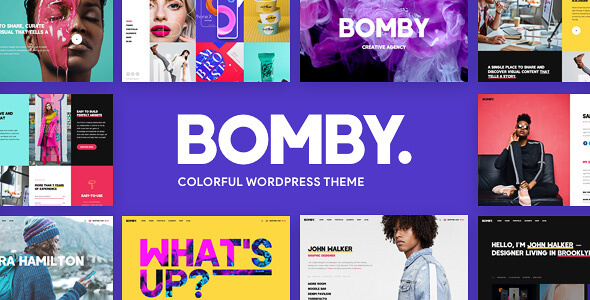 Bomby is a powerful WordPress theme for multipurpose that support for making drag and drop web pages with minimal times. A massive amount of features available for home pages, landing pages, and sales pages. Bomby will allow making stunning pages with 50+ layouts designs, that you can get an experiment with. The great thing is it has a nice admin theme options panel that allows making your website with easy step without miss any features. Provides demo import content within a minute your website will be ready to use. Dozens of unique portfolio styles and stunning hover effect with easy customization and edit as per your needs. Live editable and configurable widget and the menu that can make your website more creative better your think. To keep your audience more active it has smooth and elegant off canvas animation and illustration that looks pretty awesome. Again great feature from Bomby, uses Ajax to online cart feature with WooCommerce integration where you can make the easy online shop with bomby theme. Brook is a creative WordPress theme for different purposes. Its looks very professional and fantastic features to make the powerful high functional multipurpose website for business, blog, portfolio and more. It’s powered 30+ unique rich customizable homepage with the different features list that you can try and import it with the single click. As well as brook offering 20+ blog styles and layouts which includes grid column, Mansory, column sidebar, classic right sidebar, grid sticky and more. With the support of WPBakery page builder to make the adjustment on your website as your needs. 12 different types of the header will give your website to additional looks, don’t forget apply all the types and select the best suitable for your purpose. Likewise massive features available real buyer that you can use of it. Reco is responsive WordPress themes for the magazine, blog, mockups, and digital and other website purposes. It’s amazing and stunning layouts design gives awesome looks for your websites. With this theme, you can showcase your portfolio and galleries accurately without any hassle. Its supper excellent features provide to make your high performing website with SEO friendly codes. In another hand, it has a powerful admin theme options panel to build your website with the live preview option. 9 unique widgets give more controls to your website where you can place it as per your requirements. 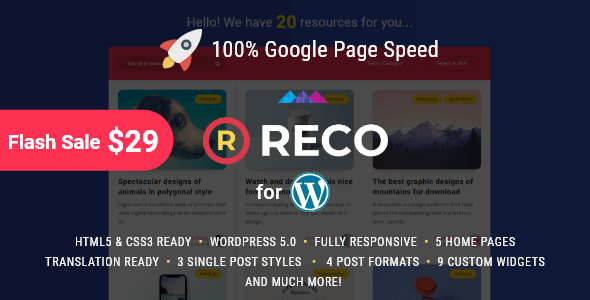 Optimized speed, reco uses several techniques to improve website speed and performance to increase the light weight of your website. What our test score says, it has excellent load time in all the devices including mobile, desktop, tablet and laptops. Three different types of single post layouts which are full width, classic view, and post without sidebar. Jannah theme is one best and trending WordPress theme for newspaper and magazine websites. It has a fresh and amazing view with one click demo import that will create your website under one minute. It has the number of pre-made demos which you can check for further development. It provides features to upload your fonts to your website to make your more functional. 100% fully responsive theme which can access from almost any kind of devices, along with unlimited header selection will lead your development further level. Additionally, it’s compatible with AMP to create mobile-friendly contents with instant loading time. Amazing page and admin theme options panel allow making your website design and topics uniquely and proudly. As well as its support for the WooCommerce plugin that you can integrate and make the online shop. 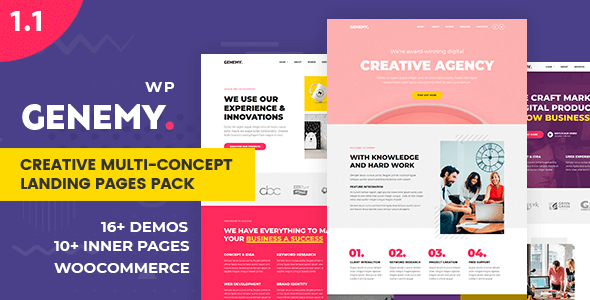 Genemy – Creative Multi-Concept Landing Page. 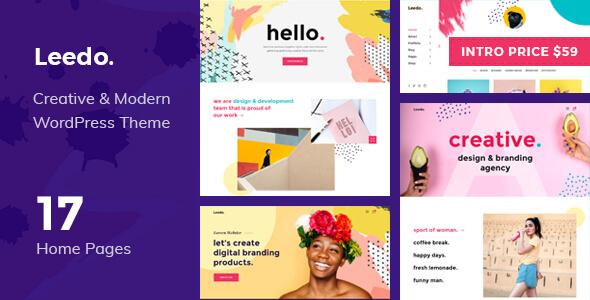 Genemy is modern and creative multi-purpose responsive WordPress themes, it will best for startups, agency, and creative websites. Giving three unique and creative portfolio layouts that will increase the reliability of your website among the audience. Meantime it has three blog layout that you can preferable one for your website. 100% fully responsive that access from any devices such as mobile, desktop, laptop and tablets. Powerful theme option provides to make incredible pages and layouts with sidebar, layouts and more. Support for WooCommerce plugin that you simply integrate with your website make and manage your shop pages and make some extra cash online.